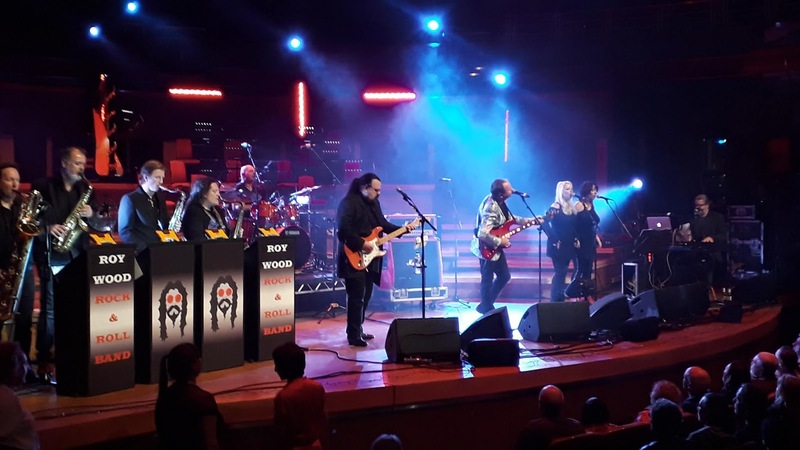 Roy Wood, his band and his many guests literally rock and rolled back the years on Sunday night (2nd December) to orchestrate another top class evening of festive entertainment in front over 2,000 appreciative fans at Birmingham's prestigious Symphony Hall. With local swing supremos King Pleasure & The Biscuit Boys, returning comedian Mick Miller, Mark King, Alfie Boe, The Enigma Strings on the bill, Yours Truly KJS and elobeatlesforever (elobf) had an feeling that this would be a memorable night with such a varied if not inspired cast - and so it proved to be. 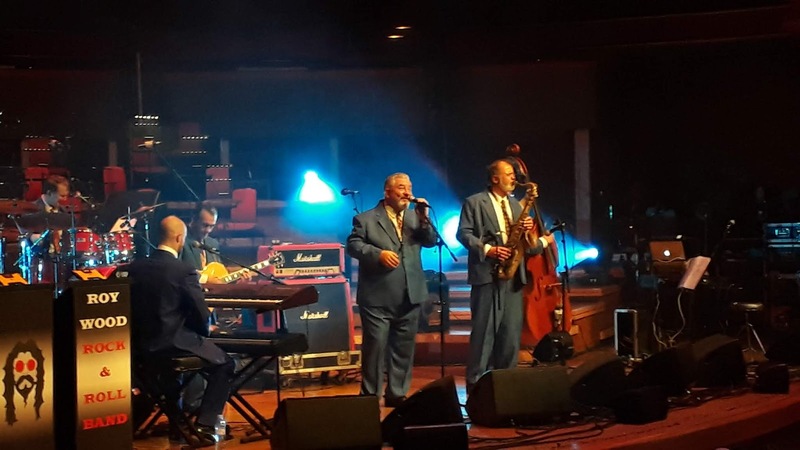 The first act on stage were King Pleasure & The Biscuit Boys and they used their forty five minutes to great effect as the six piece swing and boogie outfit - including saxophonist Big John 'Boysey' Battrum on double duty - kept everyones feet tapping with a polished performance, the highlight of which being their interpretations of "Shake, Rattle & Roll" and a very smooth "Tequila". The on and off stage wanderings of double bassist Shark Van Schtoop and Mr. King Pleasure himself also brought a smile to the face as we headed towards the entrance of the good Dr. Wood! Mick Miller then opened Act II with his amusing, deadpan comedy before The Move, ELO creator and Wizzard founder Roy Wood arrived on stage alongside his superb Rock 'n' Roll Band to rapturous applause before taking us on a journey through seven Woody penned Top 10 hits (and two chart toppers!) and reminding those assembled of his truly amazing career and his place in music folklore. 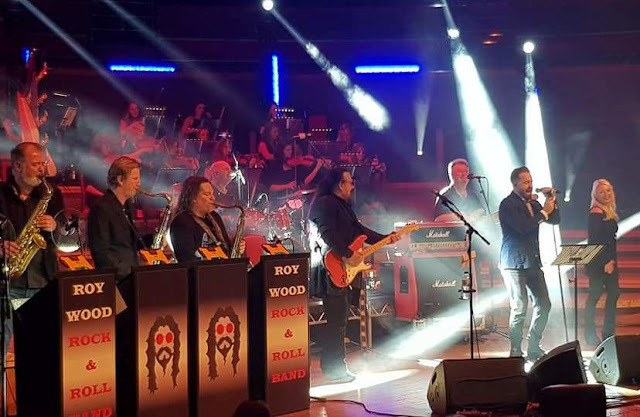 This writer never tires of seeing Roy disappear off stage during "R U Red E 2 Rock" and reappear with bagpipes and the fantastic backing of the Birmingham Irish Pipes & Drums Band ... it's pure magic! 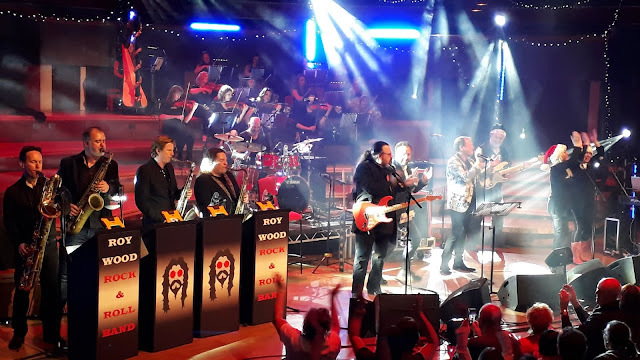 Level 42 founder and world renowned bassist Mark King bounded onto stage to join the festivities next replete with his LED enlightened guitar and led the band through two of their biggest hit singles: "Lessons In Love" and "Running In The Family". It was nice to see Roy tackle some unfamiliar verses, a sign that he was enjoying the night and working anew with Mark. Undoubtedly, this cameo lifted the atmosphere a notch or two. The Enigma Strings then graced the stage before a wonderful stringed version "Flowers In The Rain" fulfilled Roy's twin visions of a rock band with an orchestra and/or a jazz influenced brass element. The arrival of acclaimed tenor Alfie Boe riding high on the success of his latest album "As Time Goes By" to more excited applause heralded another step change in what was becoming an inspired night as he enchanted all with "Bring Him Home" from "Les Miserables" before receiving a standing ovation thereafter. If that wasn't a delight, then his sharing the vocals for "Blackberry Way" very definitely was! 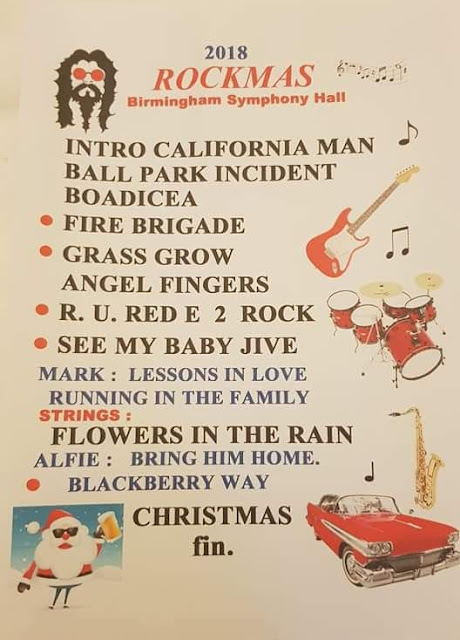 Jumping up and down, pumped up with excitement, Alfie grabbed mike and stand in true Rod Stewart style and then rocked the proverbial joint with Roy. His energy energized the whole crowd and meant that the finale of "I Wish It Could Be Christmas Everyday" with a full stage was even more joyful and fun than usual. This was one of the best gigs I had seen of Roy's for quite a while. You would probably have to go back to the symphony hall gig in the early 90's (94) when his guests were Kim Wilde and Nigel Kennedy to be on a par. It's great to hear strings to Blackberry Way, this was the vision for ELO. Sadly this route was blocked by the "management" as being too expensive! Alfie Boe singing Blackberry way was extra special, just wow factor! Already got my tickets for next year, suggest you do too, it will be a sell out!! Good on him! All the best Roy!